The Transformation page, admirably edited by Michael Edwards for the impressive openDemocracy website, kindly published my journalistic effort to promote an idea — I hesitate to call it a philosophy — that came to me while writing the concluding chapters of the book on Big Flame that I’m writing with Keven McDonnell. At first I called it ’emotional materialism’ but I thought people would laugh (overtones of excessively excited leftists crying over the class struggle?). I took ‘sensuous’ from Karl Marx’s early philosophical writing where he is breaking with idealism and positing everyday human activity — as humans everywhere make their material and social world — as the fundamental unit of society. I’m Secretary to the David Oluwale Memorial Association (DOMA) and I spend a lot of my time reminding all those who are interested of the fate of a man who stowed away on a ship leaving Lagos in 1949, and who was killed by two policemen in Leeds in 1969. We believe he was killed, but the judge at the policemen’s trial didn’t allow the jury to consider the relevant evidence, so they were acquitted on manslaughter and convicted only of causing him actual bodily harm. My friend Dr Quentin Outram (University of Leeds) knew about the campaign DOMA has launched for a public memorial to David Oluwale in the centre of Leeds, near the River Aire, in which David was drowned. Quentin suggested I write a chapter for a book he was editing about secular martyrs in Britain and Ireland. More on the David Oluwale Memorial Association here. It’s exactly a year since Zygmunt died. I wrote this soon afterwards but now is the time to circulate it. He had such a big impact on me and I miss him. So much worse for his family. How hard it is to write about an exceedingly famous person you’ve known for more than 50 years, whose home you’ve visited, whose daughter and son-in-law are friends, whose work has influenced you deeply . . . but who can’t easily be fitted him into any of the frames, such as ‘teacher’, or ‘friend’, and who would turn in his grave if you said ‘guru’. I’m settling on ‘intellectual’ and ‘human’. Of course I can’t separate the two. There are acres of words about his intellectual contribution, so I want to think here about the human being that I got to know. It was his human-ness that always struck me. In 1971, my third year as an undergraduate at Leeds University’s moribund sociology department, he strode into the lecture and spoke rapidly in his Polish-inflected English. I thought ‘At last we have a Professor who is a real sociologist’. I was intrigued by his decision to come to England. Anti-Semitism had driven him out of Poland and into exile in Israel in 1964, but he’d rejected Israel. He could be described as a migrant, and thus as an outsider. We revolting students had been rather pleased when, in 1970, Zygmunt’s predecessor, a statistician, resigned. We set up a committee to appoint a professor of our own choice, and we wrote to Erich Fromm, Colin McCabe and Laurie Taylor asking them to apply for the vacancy. Unbeknown to us, Lord Boyle, the new Vice Chancellor of Leeds University, had expressed dismay at the complete absence of Marxists in his social science department. (Those were the days when Tories respected liberal education.) 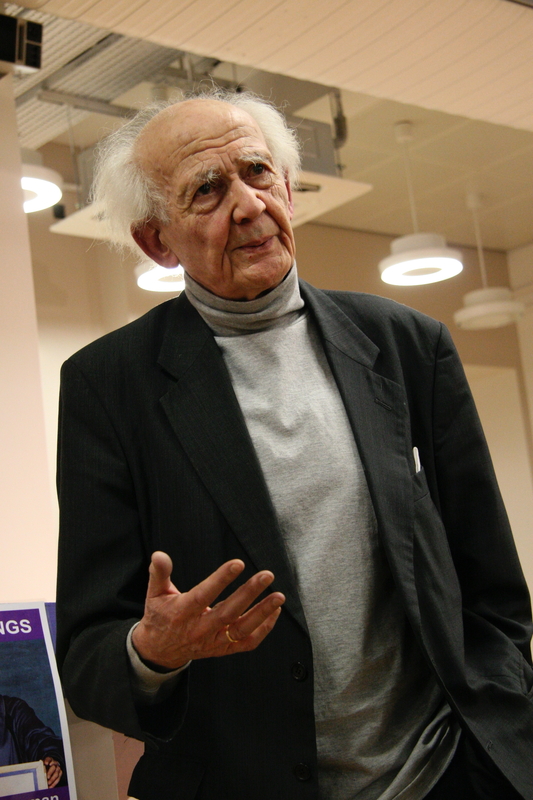 Ralph Miliband was head-hunted as Professor of Politics and Zygmunt Bauman became Professor of Sociology. Zygmunt, for his part, was amazed to find no-one in his department taught phenomenological sociology. So he asked a young lecturer to read Alfred Shütz and tell the third years all about the new sociology that was emerging. I already liked Weber and Sartre so I read it up and enjoyed what little I could understand. This tells us that Zygmunt was never stuck in a particular sociological rut: he respected the broad field of sociology. Thus the bunch of us who became PhD students in his department in 1972 were from all the theoretical branches of the sociological tree. One was in the International Socialists. Another waved Althusser’s flag. Another repeated the adage ‘The Marxists have changed the world; the problem is to understand it’. This wit consigned himself to the library where he spent the rest of his career. Zygmunt, on the other hand, seemed to want the hundred flowers to bloom. I soon got a flavour of Zygmunt the person after I read a biography of Marx. I told Zygmunt I was outraged to find that Marx borrowed money from Engels and boasted he’d won it on the stock exchange. Zygmunt told me to separate the man from the work. It’s not something I entirely believe today, but he saved me in one sentence from the ad hominem folly. It was the kindly way he said it that I recall most clearly. I felt he appreciated my indignation, and wanted gently to offer some guidance. In 1973 I leaked the exam paper to the students we postgrads were supposed to be teaching. Zygmunt found out. Instead of launching a disciplinary process he channeled the famous “thieves thieve” line from Godard’s A Bout de Souffle. Zygmunt told the staff meeting: “Max Farrar is an anarchist. This is what anarchists do.” He just had the paper re-set. He’d no doubt read Marcuse on repressive tolerance, but I don’t think it was a ploy. He knew as well as I did that the university grading machine had little to do with the kind of critical education we aspired to. Getting the degree stamp was a game that I was playing. Giving the stamps was the game he, at that stage, had to play. Both of us wanted to change the game, but I fear we failed. Nor were there any recriminations when I dropped out of the fully-funded PhD programme. I told anyone that would listen that PhDs were useless and there was a revolution to be made. When that stalled, Zygmunt willingly re-enrolled me in the early 1980s, and then I dropped out once more. In the late 1980s we met again, when he graciously agreed to be interviewed for Emergency, a short-lived journal I was involved with. I was gnawing on the problem of fact and value, hardly aware of the argument he had developed in Legislators and Interpreters (1987). 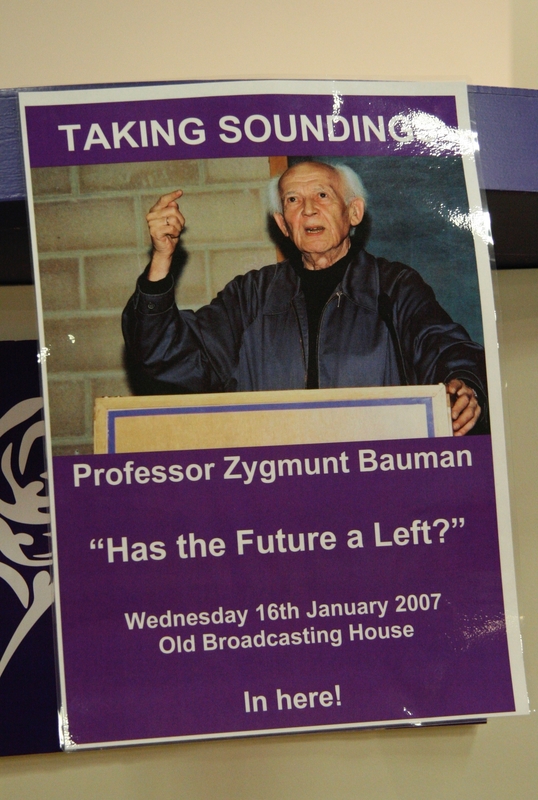 You can read the interview here Bauman Interview Emergency 5 (1990). In the interview he argued that the current ‘post-modern’ era is quite different from the modern period that generated so much contemporary thought. He said that values, not facts, are at the basis of what we know, thus the idea of social ‘science’ is invalid. I was awe-struck at his breadth, his lucidity, his ability to stitch together ideas I’d glimpsed at university and developed haphazardly in the revolutionary organisation Big Flame. Reading the article today, published in 1990, I see the foundations of several more books that appeared after he retired in 1991. In 1994 I asked him if he’d supervise the thesis I really would write, now I’d spent 25 years gathering the material I needed. He said “PhDs are a waste of time; don’t bother”. He added that he’d only begun to really think when he retired from university life. He’d read some of my journalism about multicultural, inner-city life, and he was very complimentary. Stick with that, was his message. He really did not think much of Higher Education as a place of serious and useful enquiry. I said I was 40 and I needed to get a PhD and try and form a career. So, without reservation, he said he’d help. Since my thesis was to have ‘race’ at its heart, he said I should read his Telos article ‘Strangers: the social construction of universality and particularity’ (1988). The article foreshadowed so many of his later concerns about refugees and ‘securitisation’. He cited Georg Simmel: the stranger is ‘the man who comes today and stays tomorrow’. Because the stranger blurs the boundary lines, synthesising cultures, he upsets the complacent social order he encounters. Zygmunt reminded me of David Oluwale, the destitute British-Nigerian, when he wrote: ‘The stranger who is not just out of place, but, in addition, homeless in the absolute sense, may become a tempting object of genocide’. David Oluwale slept rough on the streets of Leeds until, the Remember Oluwale charity believes, he was killed by two policemen in 1969. I’m referring to Zygmunt’s intellect while reminding myself that his sociological interests were, at root, humanitarian concerns. Not for him dry facts or obscure, mechanical theories. What’s at stake in his writing is the human condition and the future of the globe. Ideas are to be developed in pursuit of a better life for all, where ‘better’ entails real equality, justice, democracy and freedom. We met again in his bohemian home in north Leeds in 1994. I was to interview him for the socialist magazine Red Pepper. The topic was the Holocaust, as represented in Spielberg’s Schindler’s List (1993) and The Holocaust for Beginners (Bresheeth, Hood and Jantz, 1994). I’m so pleased to see that this article Baumans Facing Up To The Holocaust contains as much of his wife Janina’s thoughts as it does of Zygmunt’s. Irena, their daughter who lives in Leeds, told me that the Holocaust article worked well because it captured her dad as a will-o’-the-wisp, disappearing in mid-sentence to find a book, jumping up to serve more biscuits, pacing the room and puffing his pipe. Janina liked it because it put on record a point she felt was too rarely acknowledged: she, like many other Jews, was saved because so many Catholic Poles were humanitarians and brave anti-Nazis. When Janina died in 2009 I thought Zygmunt might never get over the loss. It showed how little I knew him. Bereaved, bereft, he was a stoic who counted his blessings and carried on. In 1998 he read the final draft of my PhD thesis overnight and made illuminating observations. Much as I learned from him, his academic support was, I suppose, more existential than intellectual: if he believed in me, I could believe in myself. Tracking back to my first encounters I reflect that Zygmunt saw that I wasn’t a fully committed sociologist, but it didn’t matter. I was more interested in political action, guided by any good thinking I could magpie. He fought with the Red Army. He stuck with the Polish Communist Party as long as he possibly could. He wanted real change just as much as I did. With his experience of expulsion and self-exile, it’s right that he chose mainly to think. ‘Otherness’ bore down on him; he crossed borders and built bridges by teaching and writing. We would sometimes meet socially. Here, the conviviality he expressed in interviews — the coffee, the soft drinks, the croissants — extended to his extraordinary fusion-cooking and lashings of alcohol. “You are a bourbon man,” he announced when we first arrived for dinner. A tumbler of amber liquor was placed in my hand. Then we’d meet sometimes while he was on the circuit. He was always affable and affirming. And so self-effacing. I sat beside him in a cinema in Sheffield where they were showing ‘The Trouble with Being Human These Days’, Bartek Dziadosz’s (2014) feature-length documentary about him. He’d had enough after about 20 minutes. I assumed he’d gone out to smoke his pipe. When he didn’t return I went to look for him. He’d legged it to the station to get home; he wasn’t hanging around for the eulogy. 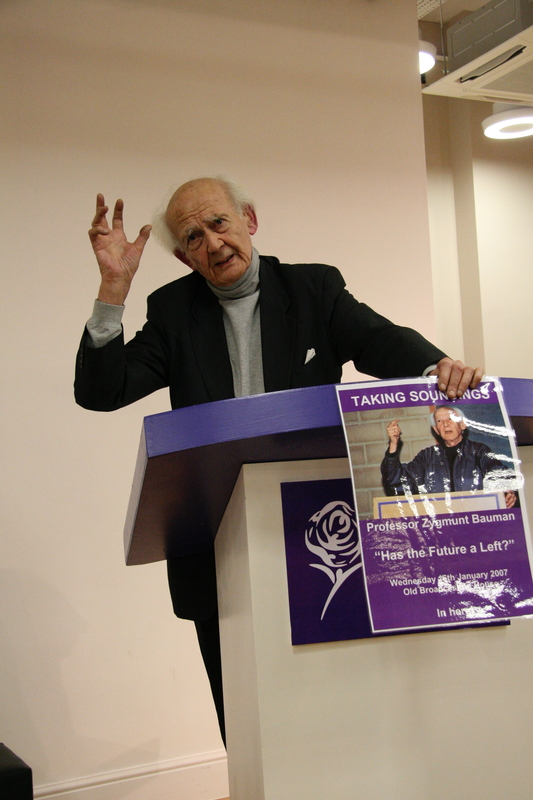 When I last saw him in November 2016 he was agreeing to give a talk for us at the re-launch of Leeds Taking Soundings, a political/cultural group he had originally launched for us in 2007. He was infirm but as mentally energetic as ever. Out of the blue he said his writing had no value, it was action that counted. By then I felt confident I could disagree. How could there be any useful action without serious thought underlying it? His work is at the foundation of progressive politics in the 21st century. He didn’t look remotely convinced, but I’m glad I said it, forcefully. I am going to frame Zygmunt as a mentor and count myself as one among his pantheon of friends. I will be guided by his writing and I will honour his intense humanity. I will always be grateful for his kindness.